Condor is a German-based airline that is part of the Thomas Cook group and based in Frankfurt. The airline was established in 1955, and they have about 45 aircraft flying from Germany to Europe and destinations in Asia, Africa, North America and South America. Frankfurt to Seattle in business class onboard their Boeing 767 aircraft which has a new business class installed since 2014. Frankfurt to Las Palmas in economy class onboard their short haul A320 aircraft. Below you will find the business class meal experience, as well as the economy class pre-order meal experience, enjoy! It all starts with a drink of course, and right after take off the cabin crew were quick to take orders and serve drinks to everyone in business class before the main meal service. Tomato juice tastes great at 35,000ft and always a tasty, refreshing option, it was served alongside some packaged nuts. Love the branded glasses. Chicken breast with herb crust bulgur and mango salad and curried creme fraiche. Avocado parley mousse, quinoa salad, scampi skewer and smoked salmon fillet. Green salad with thousand island dressing. Three choices (of which one is vegetarian). Veal steak with herbs, creamy leaf spinach and sweet potatoes. Red snapper with mustard sauce, grilled vegetables and potato mash with chives. German ravioli stuffed with a vegetable filling served with a tomato and red wine sauce. Cheese and dessert to follow mains. Hello entree! How amazing does this look and yes it tasted as good as it looks. A beautiful assortment of tastes and presented well. I loved this entree; it was clean, fresh and delicious. Once the entree was finished the cabin crew cleared the tray away and then served your choice of main meal. I chose the vegetarian ravioli option which was excellently presented, while it looks a little plain it was very good. The pasta wasn’t dry at all, and the vegetable filling was delicious. Then it was time for a cheese board, which was served with a tube of balsamic vinegar that accompanied the dish, lovely presentation yet again! 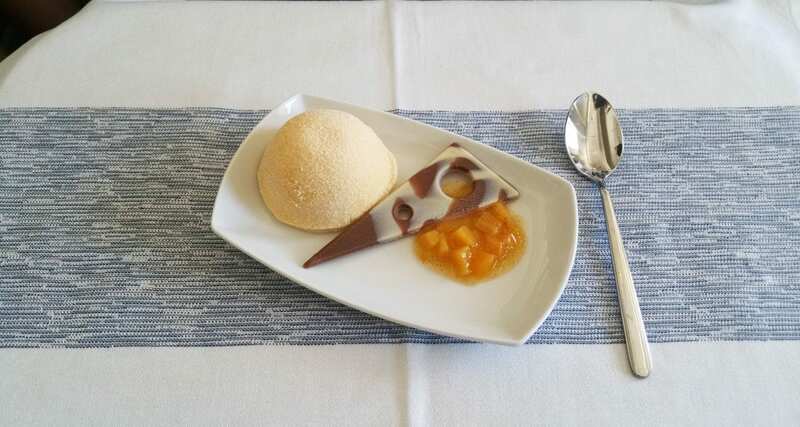 Hello dessert! A passion fruit champagne tartlet that tastes as good as it looks, I was quite full at this stage, but couldn’t say no to this offering. The second meal service was served a few hours before arrival into Seattle, and the following tray was offered. It consisted of some chicken on sticks, a tortilla wrap and a small dessert, after being served quite an amazing main meal dish I found this offering to be quite basic. That’s the only negative thing I have to say though about this business class experience, generally second meal services can be reduced due to the amount of time that cabin crew have to complete service before landing. 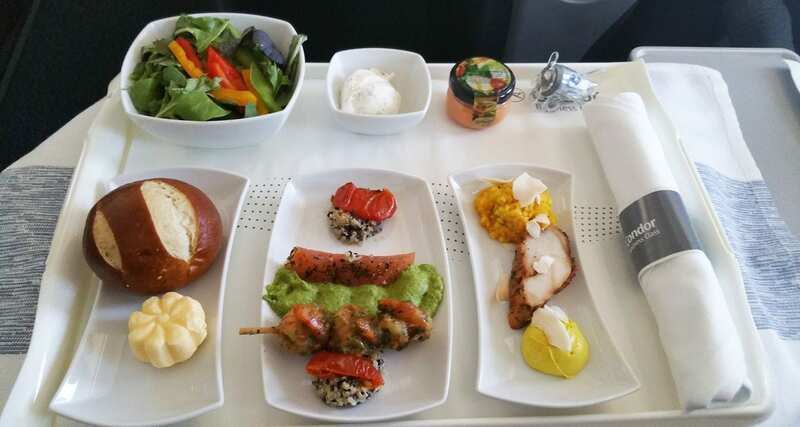 There was nothing wrong with the above meal at all; I just thought that the airline could have presented it differently or offered something slightly different perhaps. Overall the meal experience was fantastic for this flight, as I didn’t know what to expect; I had no idea it would be this good. 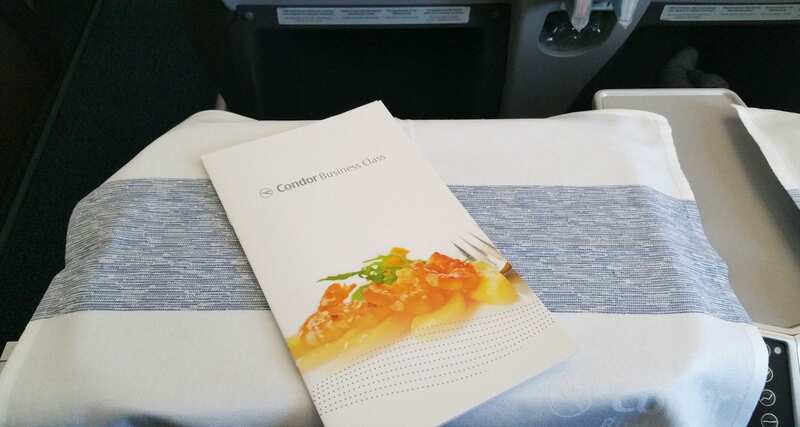 Lovely food paired with great inflight service, I hope to fly Condor again sometime in their business class. 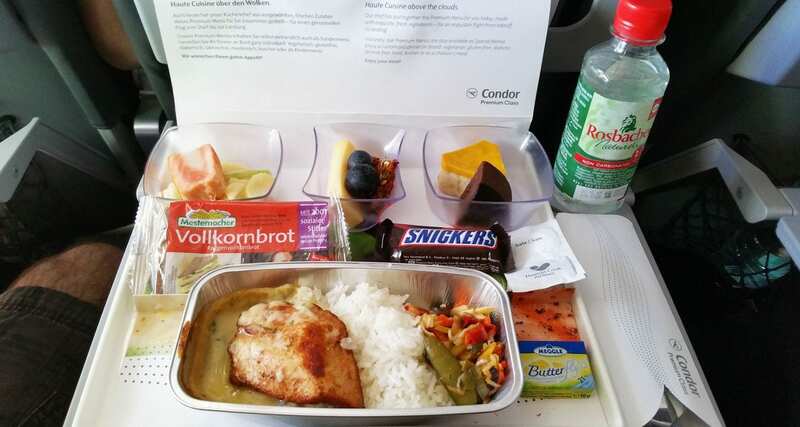 Now let’s check out the economy meals for short-haul flights across Europe. 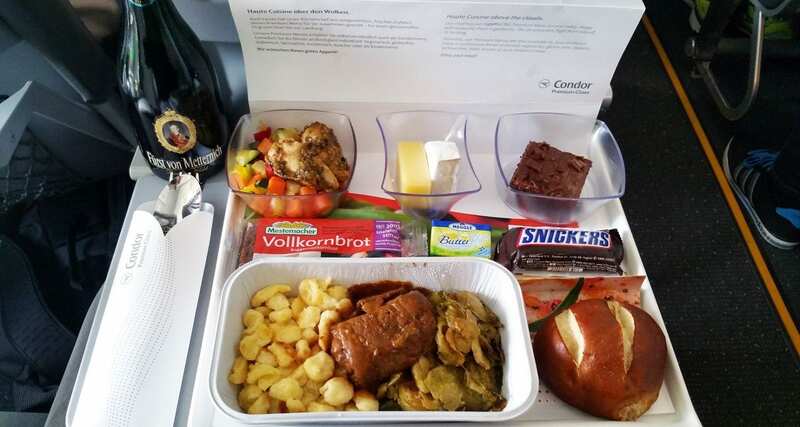 On short haul services from Germany to various destinations in Europe, the airline doesn’t offer any free meals. However, all passengers can pre-order a range of hot meal options at the time of booking. 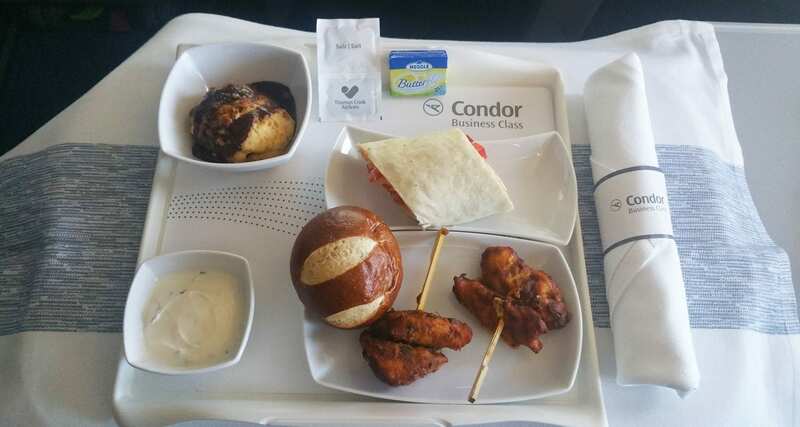 I’ve flown Condor many times from Germany to Greece, and I’ll always order a meal as I find they’re of excellent quality and offer some fresh fruits and starters too. For further information on their meals you can check out the airline information page here. Premium pre-order menu: Chicken curry with Potato salad, Assorted cheese, Mango cake and a Chocolate Brownie. There’s also water, some whole grain bread and a mini Snickers bar. All this for a cost of about €11.00, what great value. The chicken curry was fantastic, the rice wasn’t dry at all neither was the chicken. 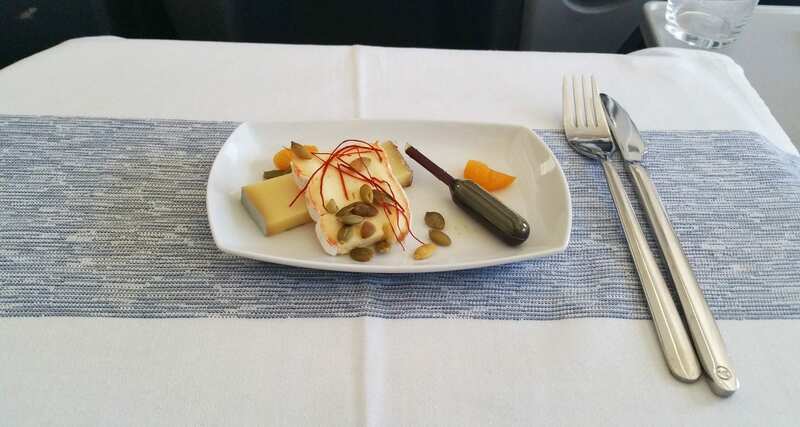 There was so much food, and I love the fact that they offer you fresh fruits and cheese too — a great inflight meal. For the return sector from Las Palmas to Frankfurt I was served quite a traditional German dish, and I loved every bite. The main meal was beef with German spaetzle (a type of pasta/noodle) with vegetables and chicken, cheese and a chocolate slice. 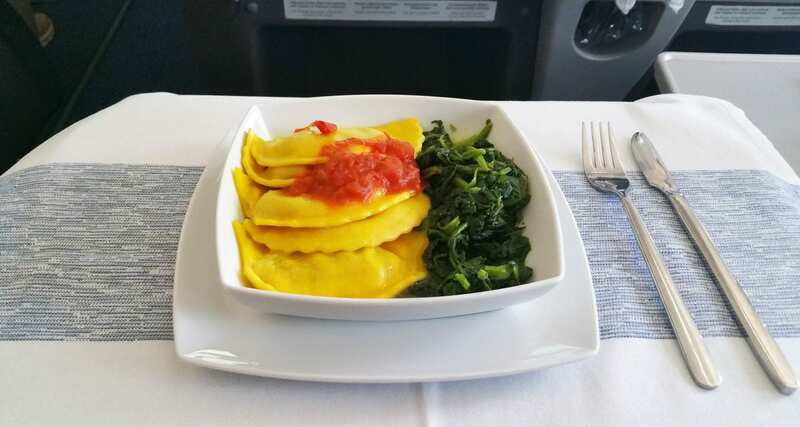 Again what a great meal for economy class and worth ordering in my opinion. Back in the summer of 2015 I also pre-ordered the following meal and as you can see the quality of these meals has remained consistent. 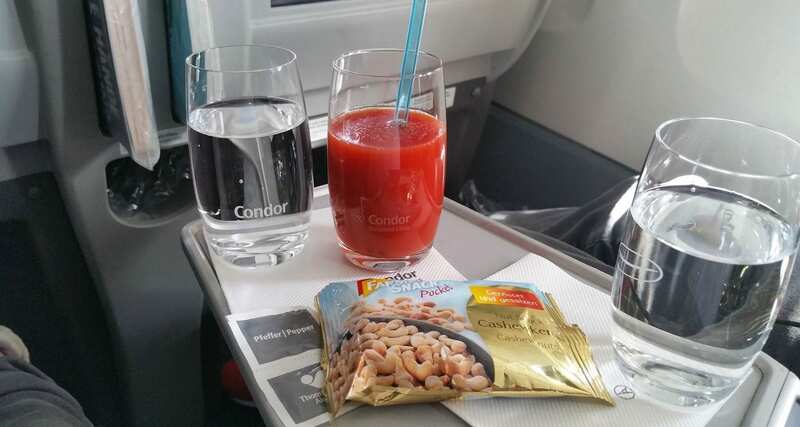 I love the Condor pre-order meal range for economy class European customers and highly recommend them.